LOVE's Haven: JOIN NOW: CDO Mom’s Mini Giveaway! Open to CDO Residents Only! 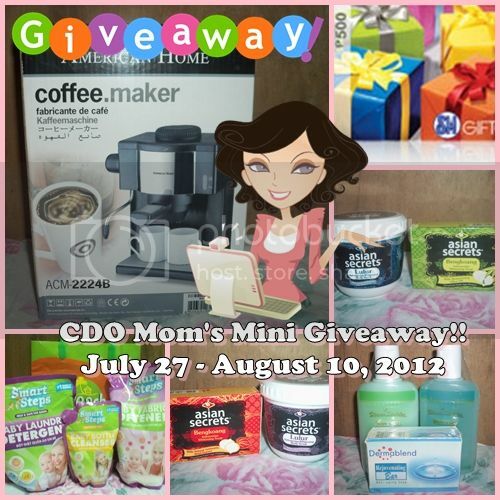 JOIN NOW: CDO Mom’s Mini Giveaway! Open to CDO Residents Only! CDO Mom just celebrated her First Blogoversary last May 2012 and as a way of thanksgiving, she have decided to run a mini-giveaway to all her readers and visitors who are living here in Cagayan de Oro City or anywhere from Northern Mindanao who is willing to meet her up if he/she wins. Yay!! By the way, the owner would also like to thank these beautiful ladies who helped her in such ways... Thanks to ZoWanderer,Empowered Mom, CDO Info Guide, A Young Mama’s Journey, Love’s Haven, inCDO.com and Lady Soda.